Ouch. Hot. It seems an odd comment to make about an ice cream, but this one somehow managed to be hot, hot, hot. Of course, it was not hot after it was done. To tell you the truth, I am surprised that this even made it to the ice cream maker. Lucky for you, my mom helped me out a bit and convinced me to forge on and follow through. You may still be wondering what exactly what I am talking about, so I will clarify. After I had caramelized the sugar, I poured the heavy cream into the saucepan. The heat in my house is not working, which ordinarily would not be a problem, but we have been in an unusually cold snap as of late. As soon as the caramel was away from the heat and the "room temperature" cream hit it, it seized up and solidified. I wasn't particularly phased, so I decided to try to melt the hardened caramel on the stove. I put the heat on medium low and began stirring. I was met with resistance from the hard caramel, but I kept trying to stir. The spoon ran into a large chunk of caramel and sloshed a big wave of boiling caramel cream onto my wrist, as well as onto the walls, the floors, and even the teapot. Embarrassed as I am to admit it, I ran upstairs crying. I know, I know; I clearly do not have a very high threshold for pain. My mom immediately started searching burn treatments on the internet then whisked me off to treat my wound. The burned area was actually pretty large, and we doused it in cool water, slathered it in aloe, and covered it with gauze. Then, we went downstairs to clean up the kitchen. Upon careful inspection, my mom declared that the caramel was probably salvageable. I was very reluctant to continue work with the caramel, but I felt that I had an obligation to you to keep trying. I brought the heat up on the burner in an attempt to melt the remaining hardened caramel pieces. After about five minutes on the stove with gentle stirring, the piece of caramel had loosened up enough to transfer to another bowl. I put the caramel into a glass bowl and slid it into the microwave. 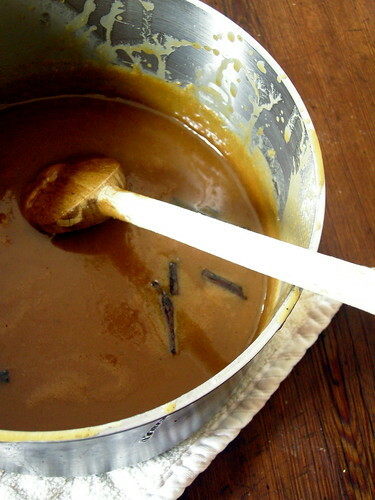 I let the microwave run just until the caramel had been melted, and then I scraped it into the saucepan. I quickly whisked a cup and a half of half-and-half into pot and then poured that into a bowl containing six egg yolks, which I had whisked together. I whisked the liquid to combine everything and then put it into the fridge to chill completely. I didn't have to cook the custard on the stove after adding the eggs because the heat of the caramel cream was enough to cook the eggs. Once the custard was cool to the touch, I took it out of the refrigerator. I pulled out my ice cream maker and set it up on the counter. I turned it on and slowly poured the custard into the bowl in a steady stream. I let the ice cream churn for twenty minutes in the ice cream maker and then transferred it into a plastic container in the freezer. 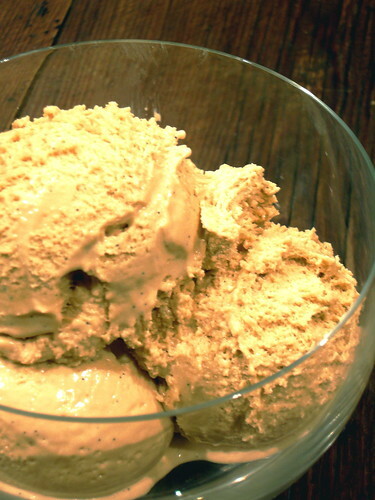 Caramel ice cream-making may be painful, but caramel ice cream-eating definitely is not. The little flecks of vanilla bean gave a sort of floral brightness to the complicated intensity of the caramel flavor. I loved how the flavor of the ice cream was warming, but the ice cream, itself was cool and creamy: it was a perfect combination. I am so sorry to hear about your battle wound. I think you should add a picture of your burn so everyone can see just how dangerous cooking really is! I don't blame you for crying one bit. Burns are the absolute worse in the pain department, I would have cried too. Glad you struggled on though so you could soothe yourself with the result. You deserved it. Where is the recipe for the ice cream? Thanks for all of your comments! I generally don't post the recipes,as I feel that it would be taking patronage away from David Lebovitz's actual book to divulge every recipe; however, if you would like it, I would be happy to type it up and send it to you!